The event discussed here took place a little over a year ago. Due to personal reasons, the protagonist wished to keep her identity a secret and I shall refer to her as "Patricia" in this narrative. On Friday, 1 March 2013, Patricia - age 27 at the time - was in the kitchen of her house. The time was around 17:15 hours and having completed some chores, she was taking a break. Patricia's kitchen has a window from which the trees of neighboring houses can be seen. 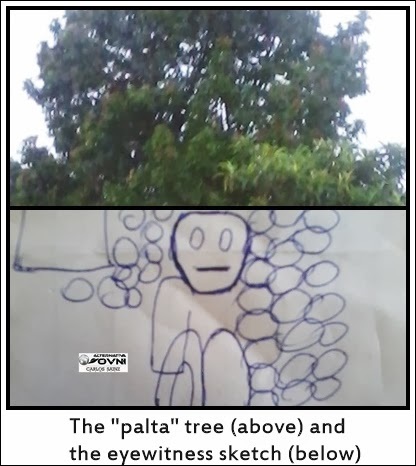 Specifically, a palta (avocado tree) located in the back yard of a neighboring property. She was looking at the bough of this tree when something caught her attention. According to her story, she saw what she described as "a little man staring back at me" from between the branches and leaves of the tree. The "entity" in question (according to Patricia) was in a squatting position and staring at her fixedly. Alarmed, Patricia ran and called for her husband, who was in another part of their home, to show him what was on the tree. When the husband reached the kitchen and looked through the window, he saw nothing unusual. He tried to calm her down (Patricia was excited and kept repeating "I swear I saw it, it was in the trees, looking at me"), and a few moments later, knowing my interest for events of this sort, she came to my home to tell me the experience. Some hours later I asked her what she'd seen and asked her to give me as faithful a description as possible of the "little man" (as she called him), and to produce a sketch of the "being". She told me at first that it reminded her of the character "Gollum" from The Lord of the Rings saga. She estimated its height at around one meter, despite not having seen the figure upright. It was very thin, hairless and with whitish eyes, "huddled" between the branches of the palta tree. She stressed the fact that it stared fixedly at her. Patricia is quite certain about what she saw. I have known her for many years. She is a person with no interest whatsoever in the UFO phenomenon or in strange "events", and is not in the least bit fantasy-prone. I am remarking this in my blog specifically because of the degree of trust she inspires in me. I do not think the following has anything to do with what Patricia claims to have seen (and I do not know it for a fact), but in the months following the apparition, one of the residents of the house adjacent to the palta tree (a neighbor, known to me) contracted a serious disease. Weeks later, in 2014, I learned that this person had committed suicide on account of this malady. I remain in contact with Patricia. Her life proceeds normally to this day and she has not seen anything out of the ordinary again, for the time being. High Strangeness: Not So Imaginary Beings?